Today, more than ever, it is essential for the ETSAM to participate actively in the world network of knowledge, creativity and applications in the field of architecture. We are convinced that the important position of prestige that the ETSAM has in the international scene can only become consolidated if we promote interchange and collaboration. Our goal is to promote, encourage and establish new relationships with the best universities and schools around the world in order to increase the mobility of professors and students, as they are our best ambassadors. The internationalization of the ETSAM aims to be the way to offer a great diversity of options for the future of the students, professors, professionals and researchers in all areas of architecture. 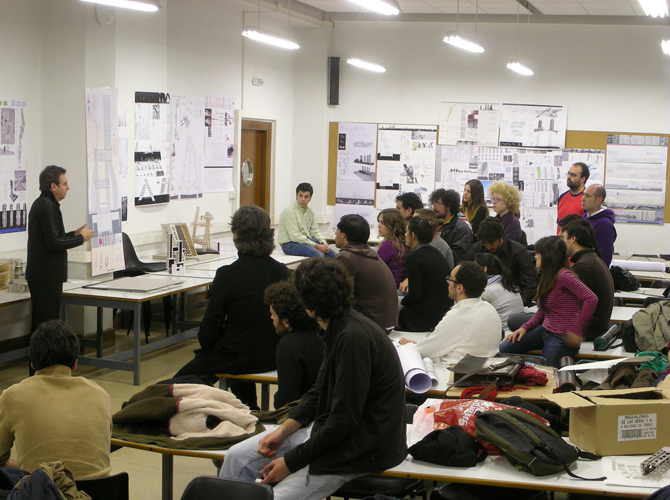 Within a school like the Universidad Politécnica de Madrid (with more than 4,000 students), the areas of work and studio vary and the strategies are not homogeneous, unlike other smaller schools that are more focused on their approach. Madrid is an overlap of more than 30 Academic Units (autonomous groups) lead by a professor with a group of approximately 130 professors and interns. From this diversity it receives its character and personality. Thus, the selected projects are a sample that represents a landscape of this school, but many other selections that would cross or oppose these projects could be proposed. The submitted material is a summary of thesis projects that start from theoretical, analytical and conceptual aspects, develop an architectural language and finish with their mechanical and constructive expression. All the projects are based on situations — site, program, use — in real needs and solutions within a free work of theoretical investigation proposed by each student. Dr. Juan Carlos Sancho is a Professor at the Escuela Técnica Superior de Arquitectura de Madrid at the Universidad Politécnica de Madrid. He graduated in Architecture in 1982 from the ETSAM and received his PhD from the same university in 1992. In 1997, along with Sol Madridejos, he founded his studio Sancho–Madridejos Architecture Office (S-MAO). Their work has been widely publicized in Spain and abroad and displayed at the architecture biennials in Venice, Quingpu and Buenos Aires, as well as the MoMA in New York.